In most cases, stand-off pads are not a place to feed animals but a large area for stock to lie down. It may however be next to a feeding area. Craig and Wendy Sheppard farm 110 ha at sea level south of Balclutha. The farm is low lying, with very wet peaty silt loam soils prone to severe pugging, especially during winter. 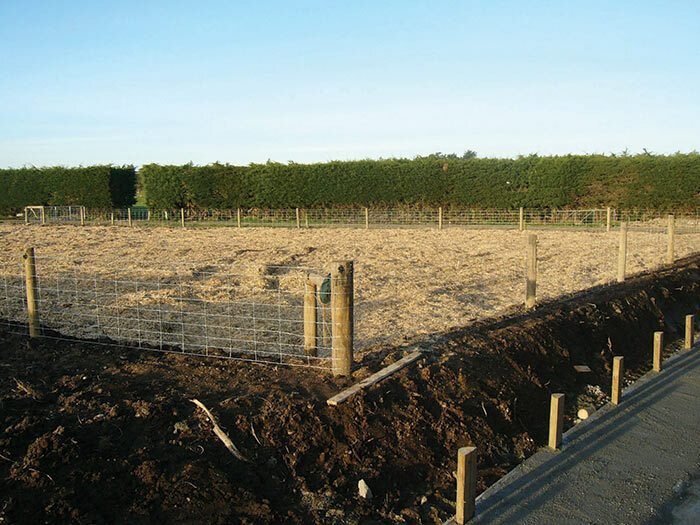 To reduce pasture damage, improve feed utilisation and reduce stress on both cows and people Craig and Wendy built two stand-off pads in 2005, and another in 2011. All three are now used only for calving. How are you using the pad? All three pads are now used as calving pads, with cows on them for 24 hours a day during this time. We winter our cows on crop. What surface materials have you tried? We initially tried sawdust, then tried using a larger chip to see if we would get more time out of it, but still only got one year. So for a few years we stuck with sawdust as the top layer due to availability and cost. These days we alternate between woodchip and post peelings depending on availability. What have you learnt about maintenance? We now manage the surface by putting a ripper through regularly which has helped with drainage and we replace the material every year. As soon as calving is finished we get it cleaned off so that it can start to dry out. Have you made any other changes to the pad? We created a feed provision around the outside which is working well. We beefed up the entrances – more rock around the entrances to keep them going, and concreted and widened the main gateway. We also invested in a vet race and head bail right on the pad so have easy access. What advice would you give someone building a stand-off pad? Put in a good drainage system. Having plenty of gateways, good drainage, netting fencing all the way around is good for calves. We have found that staff enjoy working with calving cows on the pad, we have retained staff for many seasons. In terms of value for money, we would be stuffed without them. John and Jo-Anne Milne used to farm beside the Buller River. They would expect to get flooded at least once a year, in 1995 they devised a cheap yet effective feeding system to get their cows through the winter. We caught up with John and Jo-Anne in 2011 to see how the pad was going and the changes they have made. We use the pad for winter mostly, unless it is really wet - to avoid pugging. Cows are on for about 20 hrs per day from the last week of June to end of September. We tried sawdust for one year, but it turned to soup instantly. It just couldn’t handle the rain. We now use post peel which is definitely the best for us – it holds the cows better, doesn’t mush up, cows don’t get sore feet like they do on gravel. The cows love it because they are comfortable and it is a warm surface for them. Replace post peel every year. We get seven loads (560 m3) at $1,500 per 80 m3= $10,500. Put half on at the start of winter and half before calving so that the cows have a nice clean surface to calve on. I scrape the surface layer once a week over winter. That takes about 4-5 hours a week. It takes mostly poo but also a bit of peel comes off, so the layer just wears thinner over the winter. We don’t ever replace all the material we just top it up as we go. 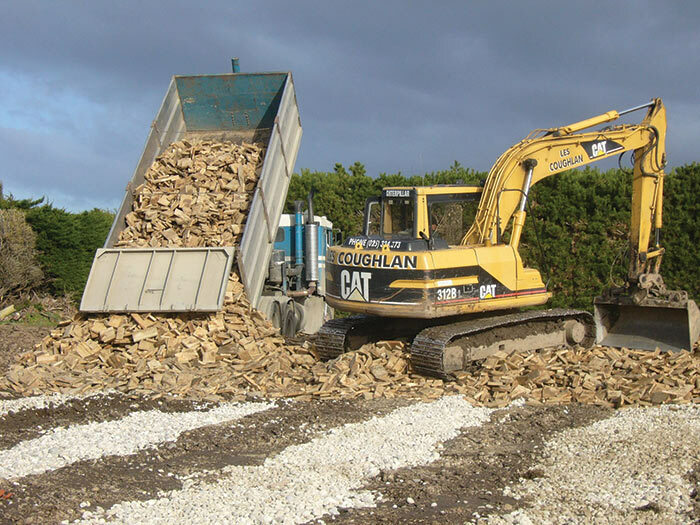 We heap up the scraped material and stockpile it. Then once a year when it is dry we spread it using a muck spreader onto the areas of the farm being re-grassed. Post peel costs are increasing, and it is hard to get hold of these days (2011). We have a standing contract. The local trucking company has the whole 12 month period to deliver the total amount of peel so they just fit it in when they can. This avoids problems with rushing and saying we need it all by certain date. We still have shelter on one side. But we removed some of the shelter to let the air flow better dry it out. This made a big difference as there was just too much shade. We had two holding ponds for effluent from the stand-off pad but we put in a third holding pond to collect any effluent and silage leachate from the feed race. This is working really well. Work out the best place for the pad on the farm, keep it central if possible. Think really hard about what you are going to do with the effluent. I wish we had made it bigger from the start, with more space per cow. Keep it clean - it only takes a little bit of time, but it is well worth it. The best decision we made was not to feed out on the pad so we don’t have as much effluent to deal with. We are planning to pull up all the drainage as it has slowed down over the years. We will replace the old materials with new reject stone and nova flow drainage pipe, then post peel layer. While we are doing this, we are also going to make the pad bigger to give the cows more space. In terms of value for money, I think the pad is absolutely worth it. I don’t think there is any other way we could do it. It’s great from a cow welfare perspective. The pad allows us to operate the farm with one person all winter. We’ve got it sorted. Low stress! The future comes down to post peel availability, this will be the limiting factor for the pad system. 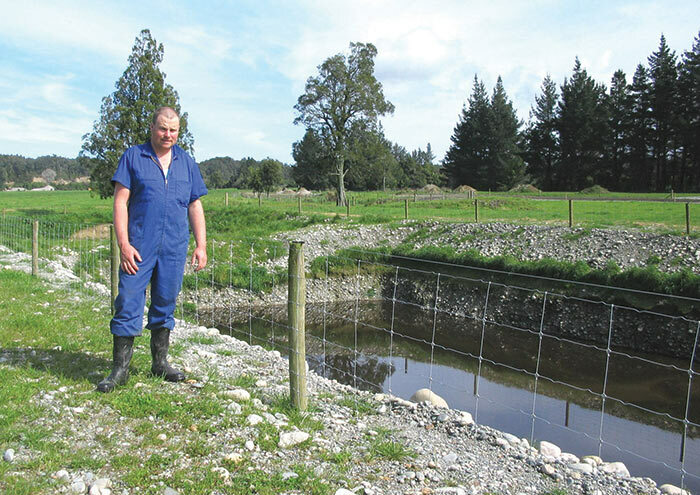 Waharoa farmer Stu Muckle reckons new tools developed to improve the comfort of cows on stand-off pads will really help farmers do the right thing for their animals. Stu was pleased to take part in trials carried out recently to assess the new tools, developed by DairyNZ working with AgResearch – an online stand-off pad calculator and an easy to use gumboot test. These practical indicators help farmers identify when a stand-off pad is becoming too wet for cows to lie down, meaning it’s uncomfortable for them, so farmers can take steps to improve conditions for their cows. 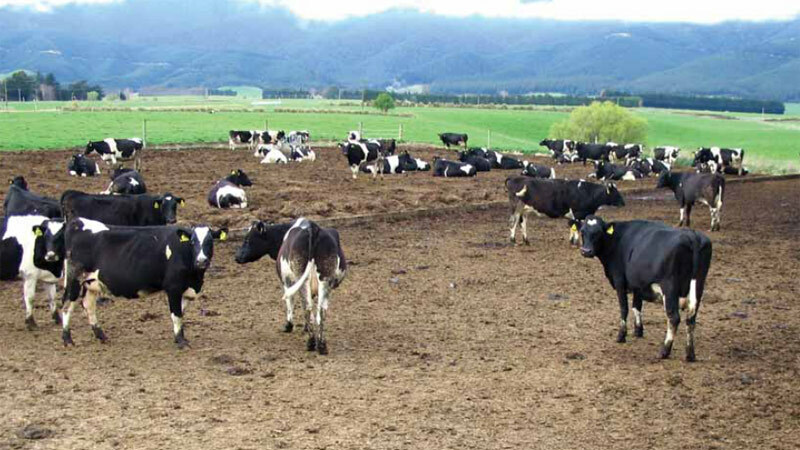 Research shows cows stop lying down on a stand-off pad when the moisture content of a pad’s lying surface reaches 75%. Thanks to the new aids, farmers get early indicators of when this moisture content is being reached so they can take action at the right time. Stu’s farm was one of five farms in the trials that proved that the tools work. 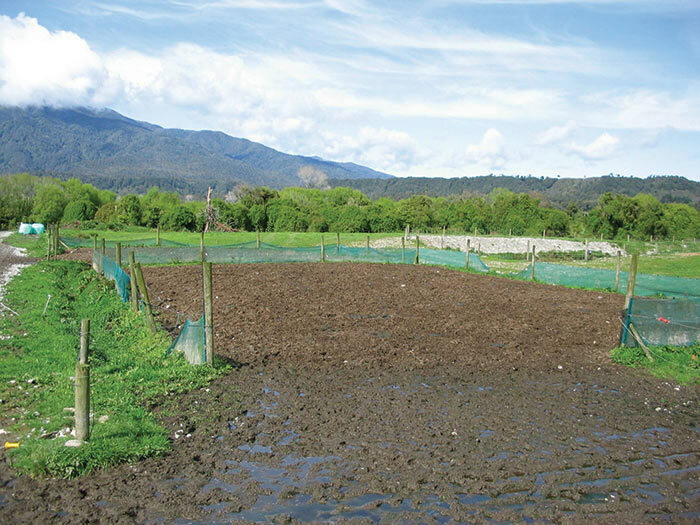 The trials were a collaboration and were managed by DairyNZ Animal Care Team Manager Helen Thoday, AgResearch Senior Scientist Cheryl O’Connor and Annexa veterinarian Katrina Roberts. In the trial on his farm, Stu recorded the times his cows were put on his stand-off pad and how long they were on it. After the cows went out to pasture, he then recorded a rough estimate of the percentage of the herd choosing to lie or sit down at different times throughout the day. “From that you can assume that, if within an hour of being let out a big percentage are sitting down, then they haven’t had enough time lying down on the stand-off pad,” Stu says. Cows should be lying down for at least eight hours a day, for their comfort and welfare. 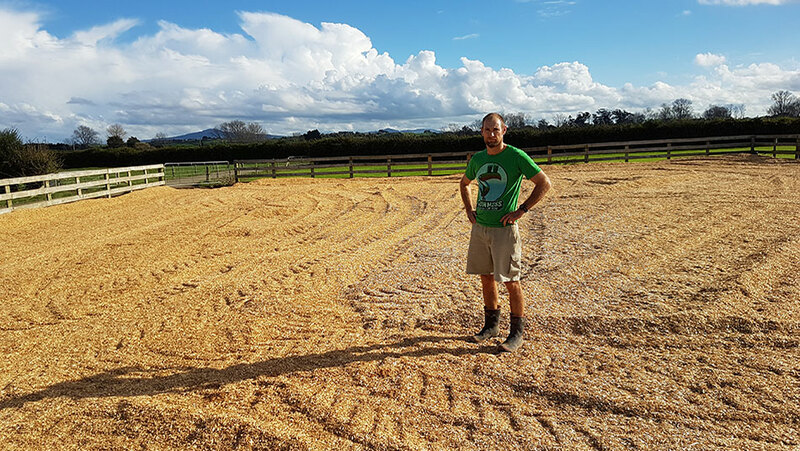 “The focus on getting the cows lying down on the stand-off pad for longer than I had assumed was enough is a new thing to me and valuable information,” Stu says. Management solutions include reducing the number of hours a day or days a year your cows are on the pad, refreshing woodchip, improving drainage or increasing pad size. Stu has nine years’ experience with stand-off pads and was happy to share his knowledge in the trial while also getting new information. Stu says the new aids will make a difference to cow welfare and he recommends them to other farmers. Stu says the stand-off pad gumboot test is a useful tool that will be valuable to farmers, especially new farmers. Before the trial, he knew to walk across a stand-off pad to assess how wet it was but the new test is more specific. The stand-off pad gumboot test has a score card that provides a visual assessment to help farmers measure the comfort level of a stand-off pad. The three areas to look at for the gumboot test are the ability for your gumboot to make an imprint, how easy it is to see whole woodchips and the level of pooling water. The stand-off pad calculator is a useful tool to calculate when a stand-off pad reaches the moisture level at which cows become uncomfortable, Stu says. With the stand-off pad calculator, you enter the number of cows on your stand-off pad, the length of time they are on the pad, the space the cows have and the average rain fall. It will calculate the tipping point at which the moisture content of the woodchip lying surface reaches 75% moisture and lying times decrease. You know to take action then. The stand-off pad gumboot test has a score card that provides a visual assessment to help farmers measure the comfort level of a stand-off pad. Find out more. 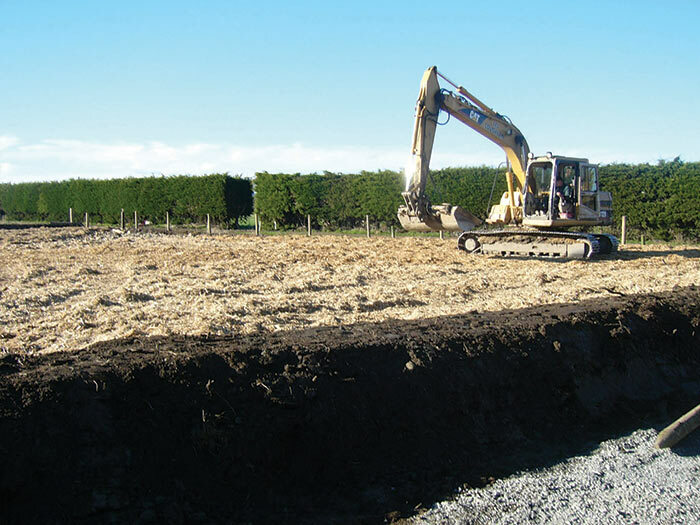 If you are thinking about putting in a stand-off pad or are interested in improving cow comfort on your current pad, the DairyNZ off paddock calculator can help you.